Definition: The A-List in AI Chipset Index includes companies providing software and hardware components of AI chipsets. AI chipset products include central processing unit (CPU), graphic processing unit (GPU), neural network processor (NNP), application specific integrated circuit (ASIC), field programmable gate array (FPGA), reduced instruction set computer (RISC) processor, accelerators and more. 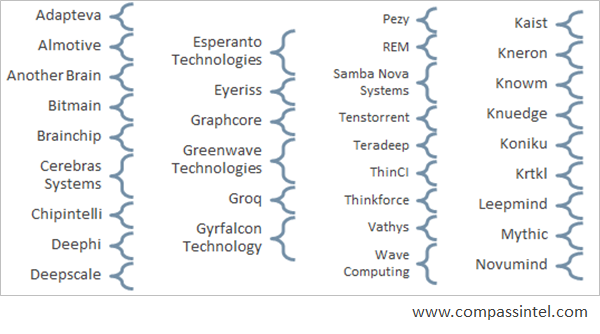 Some of the chipsets are directed at edge processing or devices, some are for servers used in cloud computing and others are directed at machine vision and autonomous vehicle platforms. Some of the products are computational framework for AI and others are for AI training platforms. The edge and server chipsets are optimized for high performance and ultra-low power running sub one trillion operations per seconds (TOPs) to 30 TOPs. Power efficiency is important for improved battery life on edge devices and lower power costs for server infrastructure. Introduction: Companies have invested over $60 billion in AI through acquisitions and startups over the last three years, in addition to their own research and development. The strong interest in AI is also reflected in the over 1.7K AI startups. The AI chipset segment is one area where companies are racing to improve chipset processing and power efficiency. Nvidia is leading the way with its Volta GPU architecture for data centers, NVIDIA DRIVE™ PX for Advanced driver assistance systems (ADAS, AI Chip for self-driving cars), Xavier system on a chip (SOC) used in the NVIDIA DRIVE™ PX 2 platform and other innovations such as the DGX-1 AI Supercomputer. Then there are startups like Knowm which is challenging the current chipset architecture where memory and processing are separated. Knowm's architecture is similar to the human brain where memory and processing are together. Other companies that made the top 24 include Marvell, Xilinx, CEVA, Cadence, General Vision, Rockchip, Cambricon, Verisilicon, and Horizon Robotics. There are 2 available report developed as a result of this research, The AI Report and The Index Report. The AI Report is a comprehensive report (click on the button above to learn more), while the Index Report is a snapshot of our model, key insights, and company specific notes, along with summary scores across key categories. (click on the button above to learn more). A total of 24 companies were included in the final ranking of this research framework, with 100+ companies evaluated. The final list includes 24 top ranked companies, with the executive summary showcasing the top 24 and the AI Driving Innovation in Tech report diving deeper to showcase all companies total score summaries across 4 main categories. A smaller Excel-based report is also available showcasing score summaries and sharing highlights of the individual companies. Contact info@compassintelligence.com to get access to any of the reports or scroll below to learn more. 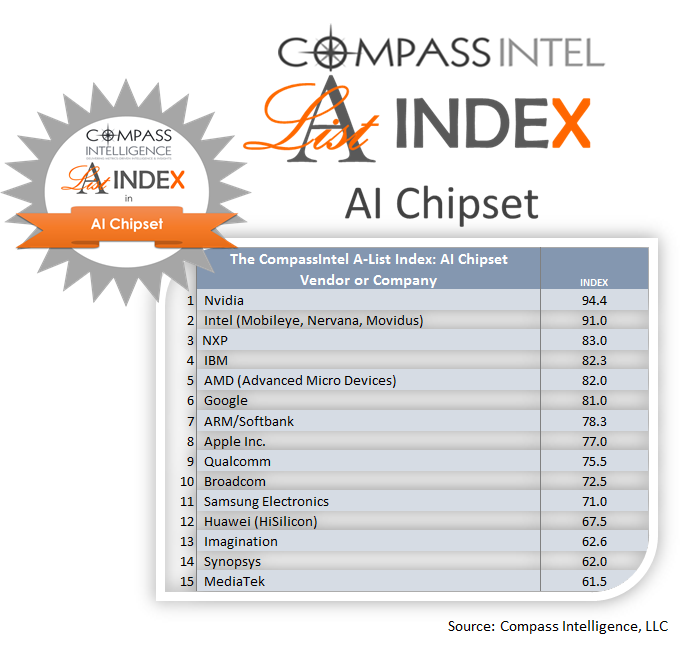 Please fill out the below form to get access to the complimentary A-List in AI Chipset Index: Executive Brief.